In 1947, a young Iowa farm boy was selected to go to American Legion Hawkeye Boys State. Later, after returning from service in the U.S. Army during the Korean Conflict, he immediately joined The American Legion Emil H. Dutler Post #177 in Mt. Auburn, Iowa. Perhaps as a sense of gratitude to the Post – or maybe he felt by being a good member that he could repay those members for the honor of attending Boys State – Whatever his reasons, he loved being a ‘blue cap’ Legionnaire and always felt they were the strength of The American Legion. Art McLaughlin was the Post member who took on the ‘taken for granted jobs’ at the Post, doing the extra things to make activities in the Post and the community even better. He did the little repair jobs around the Post and was always checking to make sure everything was going well. He was happiest when he was actively working to support the Post and his rural community. A soft-spoken leader, Art was respected throughout Mt. Auburn and The American Legion because of his ability to talk to people. He was a tireless membership worker who was constantly recruiting members for not only his home Post, but throughout Benton County, the Third District, and Iowa. A humble man, Art would be surprised to think that there is an award named in his honor. He was a quiet leader who did not work for recognition, but volunteered because it was the right thing to do. 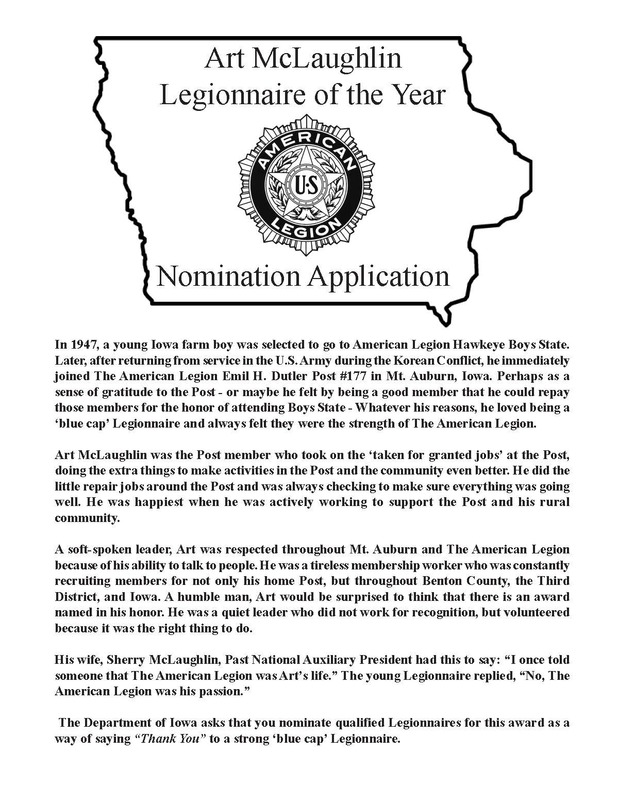 His wife, Sherry McLaughlin, Past National Auxiliary President had this to say: “I once told someone that The American Legion was Art’s life.” The young Legionnaire replied, “No, The American Legion was his passion.” The Department of Iowa asks that you nominate qualified Legionnaires for this award as a way of saying “Thank You” to a strong ‘blue cap’ Legionnaire.